The natural beauty and durability of ceramic tile makes it ideal for many areas in the home. Homeowners are now using exquisite this tile for flooring, as well as to cover surfaces like countertops, shower walls, and much more! If you are searching for high-quality tile at a great value, our local store and showroom can help. We utilize the impressive buying power of the Flooring America franchise to deliver products from the industry’s leading brands at reasonable prices. This allows homeowners to expand their budgets and invest in more flooring than they originally planned, or even upgrade to a more expensive tile solution. Our team is made up of experienced technicians and knowledgeable associates. These associates go above and beyond to provide exceptional customer service to all who enter our store. They take the time to inform you about the different types of ceramic tile available, as well as to help narrow down our large selection to the top contenders. From simple and modern to rich and luxurious, we guarantee you’ll find the perfect tile option among our vast inventory. It’s safe to say the average homeowner is not a flooring expert. If you don’t have the necessary knowledge, experience, or tools to install tile, we suggest you choose our professional installers. Too often, poor ceramic tile flooring installation results in common problems, such as loose tiles, uneven grout lines, and faulty sealants. Equipping yourself with the necessary installation materials this project requires can even prove more costly than adding professional installation fees to your overall tile purchase. To ensure your new flooring is able to withstand the activity of your daily lifestyle, depend on our team for the professional ceramic tile installation you desire. Our team includes a number of experienced technicians that complete comprehensive installations with both speed and skill. When you trust our technicians, you can be sure your new flooring surface will satisfy in all respects. There are numerous reasons to choose ceramic flooring. It is known for its affordability, durability, and ease of maintenance. Ceramic tile flooring is a viable option for many customers, particularly those that want budget-friendly new flooring for large surface areas. Ceramic tiles are easy to care for and last a very long time. If you install grout with your ceramic floor tiles, which we highly recommend, it becomes extremely resistant to water, so you do not have to worry about the tile absorbing the water and cracking. These impressive features combined with the affordable price for ceramic tile flooring make it one the best values in the flooring industry. Since it increases the resale value of your home, a tile floor made of ceramic eventually pays for itself. You can get even more value out of your purchase when you shop at our flooring store. We will give you a great deal and handle the entire installation so you that your floor fits seamlessly into any room in your home. 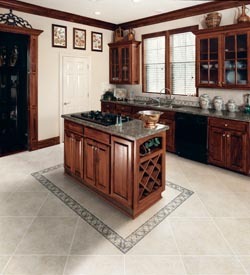 One of the simplest ways to improve the overall appearance of a room is by adding new ceramic tile flooring. Our inventory includes ceramic floor tiles in a myriad of shapes, textures, and colors. The freedom to choose the exact style of ceramic tiling you want is one reason it is an excellent choice for any room in your home. No matter what type of interior décor a room has, we can customize the tiling to be the perfect match. Whether it is your kitchen and bathroom or the living rooms and hallways, you will find the ideal type of ceramic tile flooring at our store. Be sure to ask about our discounts on flooring purchases. You can save $100 on ceramic floor tiles and take advantage of our special financing options to ensure your purchase fits within your budget. We make it easy for our customers to acquire high-end flooring at very low prices. In addition, we are known for working with our customers every step of the way—from selection to installation. If you want tile flooring that looks great far into the future, proper installation is essential. To prove our commitment to your happiness, we back all ceramic tile floors with a special promise called the Ultimate Confidence Guarantee. If you aren’t satisfied with any aspect of your new tile, you have a 30-day period after installation to take advantage of the guarantee. Our flooring technicians promise to come back to your home and replace the flooring with a similar product, free of charge. Contact us today to learn more about ceramic tile flooring for your home. We proudly serve the communities of Hooksett, Manchester, Goffstown, Bow, and Bedford, New Hampshire, as well as the surrounding areas.